founded by City of Trnava and Trnava Municipality Region in 2007. THE MISSION to help SMEs to be successful and competitive in automotive industry chains. THE VISION to create network and critical mass of relevant subjects to improve the quality of human resources, but also to support technology transfer and innovation processes mainly but not only in automotive industry. 4 ACWS Members Dipex spol. s.r.o. ANEX FORM Engineering s.r.o. Educational institutions STU Faculty of Material Science and Technology University of Ss. Cyril and Metodius Secondary Vocational School Senica Secondary Technical Vocational School Galanta Institute of materials and machine mechanics SAS Innovations centres, agencies and chambers of commerce BIC spol. s r.o. Get On Bratislava SOPK Trnava Slovak- German Chamber of Commerce and Industry Enterprises COMAX TT, a.s. EMERSON, divízia Branson SIM Plan TSU Piešťany š.p. MAKINO spol. s r. o. Švec a spol. s r.o. Služba výrobné družstvo WIGO s.r.o Kvant spol. s.r.o. Dipex spol. s.r.o. ANEX FORM Engineering s.r.o. Bornet s.r.o. Automotive Group SK spol. s r.o Qintec s.r.o. Carisch s.r.o. Carl Zeiss spol, s.r.o. ProPsy - RWS, s.r.o. Profi Tlač, Pavol Skubeň Klauke Slovakia s.r.o Zväz strojárskeho priemyslu SR Technodat, CAE-systémy, s.r.o. MAPRO Slovakia s.r.o. c2i s.r.o. CCN Casting s.r.o nebotra s.r.o., Matador Industries a.s. Inekon Systems, s.r.o. CRT-ELECTRONIC, spol. s.r.o. AUTONET Duration: 03/2010 – 02/2013 OP: Central Europe REACT Duration: 08/ /2014 OP: Crossborder Austria-Slovakia FAST INDUCTIVE CHARGING SOLUTION FOR ELECTRIC VEHICLES Duration: 10/ /2012 OP: 7. 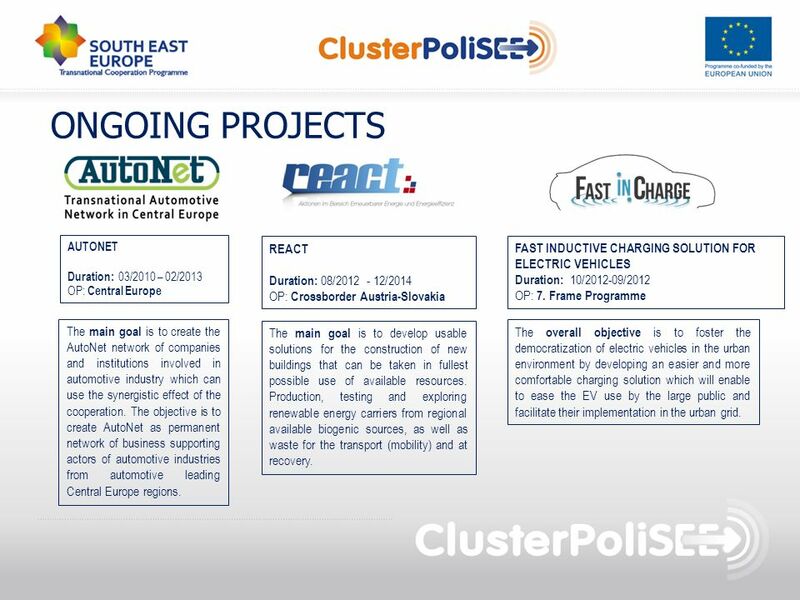 Frame Programme The main goal is to create the AutoNet network of companies and institutions involved in automotive industry which can use the synergistic effect of the cooperation. 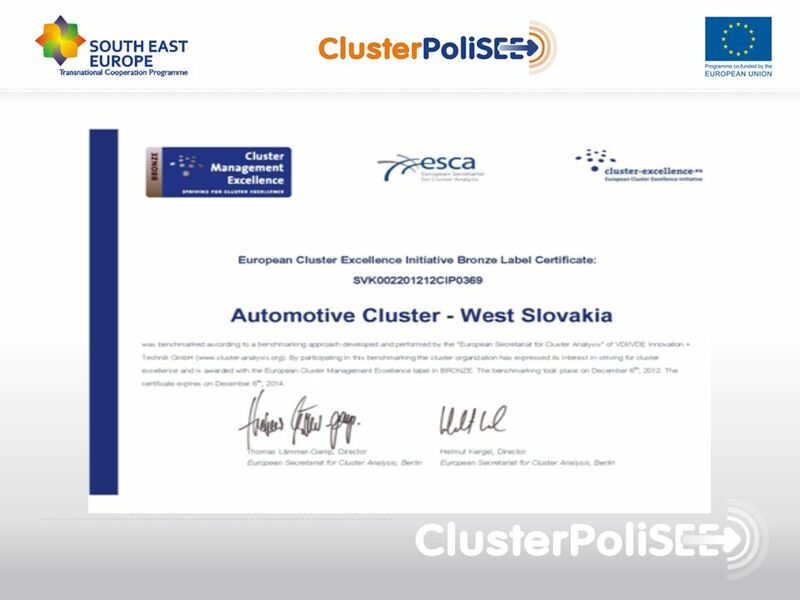 The objective is to create AutoNet as permanent network of business supporting actors of automotive industries from automotive leading Central Europe regions. The main goal is to develop usable solutions for the construction of new buildings that can be taken in fullest possible use of available resources. Production, testing and exploring renewable energy carriers from regional available biogenic sources, as well as waste for the transport (mobility) and at recovery. The overall objective is to foster the democratization of electric vehicles in the urban environment by developing an easier and more comfortable charging solution which will enable to ease the EV use by the large public and facilitate their implementation in the urban grid. Building of „Laboratories for Construction and Simulation of plastics Forming“ in STU MTF and Accreditation of new study Programme „Plastics technologies“ AC CENTROPE OP: Cross-border Cooperation AT – SK The project focused on International Slovak& Austrian Benchmarking Comparison, Contracting Meetings of Companies, Common Portal and Networking, Education for company's Employees. INNOVMAT OP: Cross-border Cooperation AT-SK The project aimed to offer easy access to experts, equipment and services in the field of material sciences . 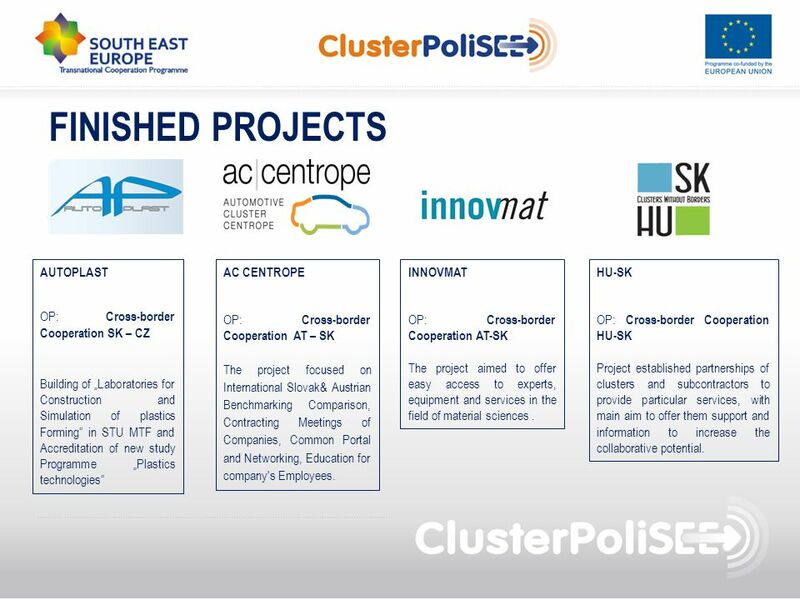 HU-SK OP: Cross-border Cooperation HU-SK Project established partnerships of clusters and subcontractors to provide particular services, with main aim to offer them support and information to increase the collaborative potential. Automotive Academy - let´s professionals to teach professionals Mission Strategy Vision Create a unique institution built on the pillars of experience, expertise, flexibility, usability and affordability. Improve knowledge and skills of professionals and managers working in the automotive industry in various management areas. Become the most appropriate and best choice of education professionals and managers working in AP Create a unique opportunity for the exchange of experiences among participants and between participants and lecturers. 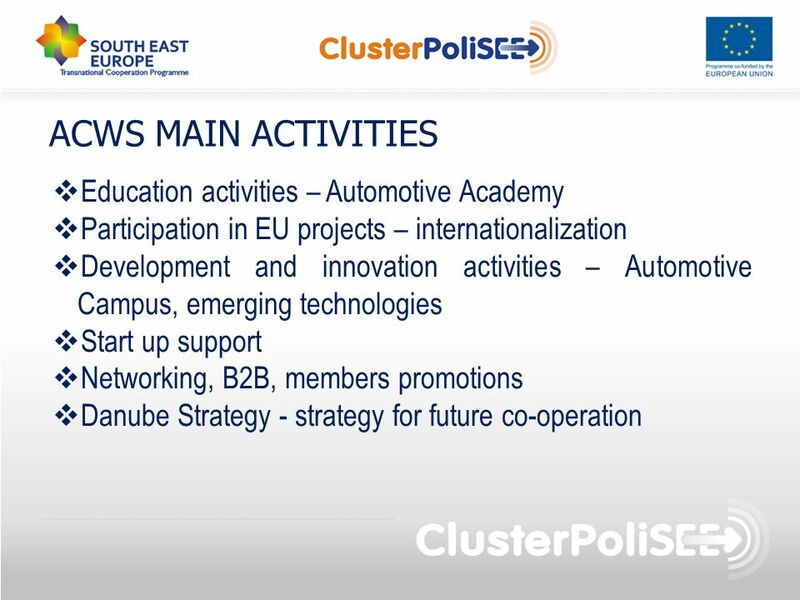 The main objective of the project is to ensure the correct orientation and a skilled workforce for the purpose of applying in a wide range of automotive industry in order to promote economic development and increasing employment in Trnava and the Moravian-Silesian region. Specific objectives: • 1 Develop the skills of human capital on the basis of sustainable cooperation between academies of automotive clusters, • 2 Create new forms of cooperation in education between companies and technical secondary vocational schools, • 3 Acquire knowledge about the needs of human capital in both clusters, • 4 Improve cluster management with a focus on the development of cluster member needs. 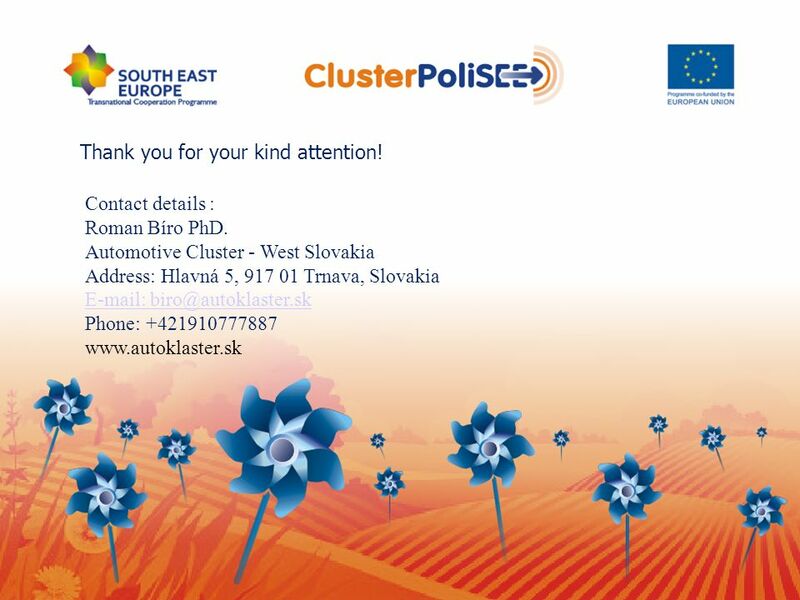 seeks for disclosure of the infrastructure needed to address industrial applications and innovations in the automotive industry for the industry subcontractors and students, it should also serve to address the challenges of submitted projects under Horizon 2020, it should serve as a base for automotive academy, conferences and workshops, it should serve as a base for emerging technologies, e.g. 3D Additive Manufacturing, Success is contingent upon the support of MTF and private resources funding from EU funds and private sources, possible incorporation in to Danube Strategy Initiative? 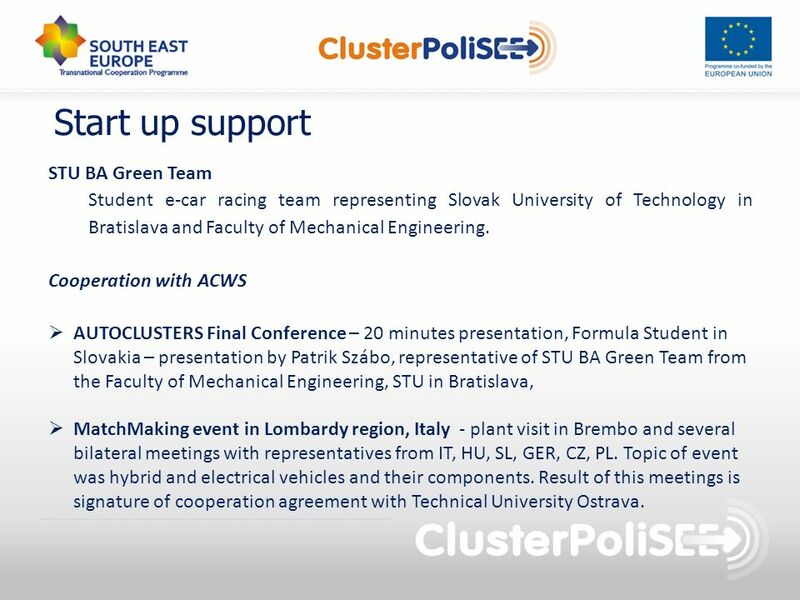 Student e-car racing team representing Slovak University of Technology in Bratislava and Faculty of Mechanical Engineering. Cooperation with ACWS AUTOCLUSTERS Final Conference – 20 minutes presentation, Formula Student in Slovakia – presentation by Patrik Szábo, representative of STU BA Green Team from the Faculty of Mechanical Engineering, STU in Bratislava, MatchMaking event in Lombardy region, Italy - plant visit in Brembo and several bilateral meetings with representatives from IT, HU, SL, GER, CZ, PL. Topic of event was hybrid and electrical vehicles and their components. Result of this meetings is signature of cooperation agreement with Technical University Ostrava. 12 Start up support RTU Europe Ltd. Founded in 2012 as a development and technology research company, focusing on detailed examination of thermodynamic processes in internal combustion engines aimed at increasing the efficiency and effectiveness. The RTU technology represents: significant reduction of the current high levels of hazardous air pollutants, increase the efficiency of currently produced internal combustion engines, hybrids and alternative power trains, reduce unnecessarily high fuel consumption as currently seen in today’s power trains. 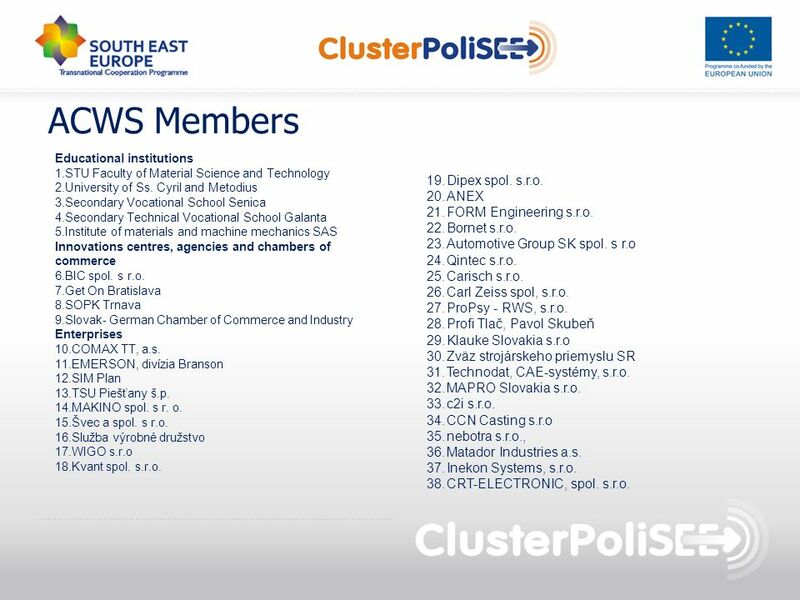 Cooperation with ACWS External consultancy to map the environment in terms of existing businesses, A database of suppliers in the automotive industry, Consultancy for project activity - consultation on current calls. ACWS welcomes the Danube Strategy Innitiative, ACWS also on the basis of plenary session of Regions EDUC-V-031 related to innovationis ready and willing to co-operate especially in innovation transfer and internationalization, ACWS experiences makes the Trnava region attractive for partners and future co-operation, The composition of members is prerequisite for future success, ACWS membership in Automotive Industry association and in Union of clusters makes the scope of possible co-operation much wider, The Automotive Campus project could be the flagship in Danube Strategy projects for Trnava region, The networking in Danube Strategy is an inevitable „must“! 15 Thank you for your kind attention! Download ppt "The Future for Danube Strategy"